Forrester™ is one of the world’s most important and influential companies for research and market analyses. The so-called “Forrester Wave”, in this specific case concerning “Sales Force Automation Solutions”, is an evaluation methodology where, based on 35 criteria, the various competitors present in the marketplace in software and hardware are classified. This report allows end customers to make informed purchasing choices in technology because not only can they deepen their knowledge on the market in general but also get detailed information about the various vendors in order to identify what best suits their specific requirements. Considering the fact that SFA (Sales Force Automation) solutions are becoming crucial in improving customer experience, they will probably also be fundamental in restoring the balance of a constantly evolving market where there is no longer talk of simply scheduling sales processes but the end customer’s buying experience plays a key role. 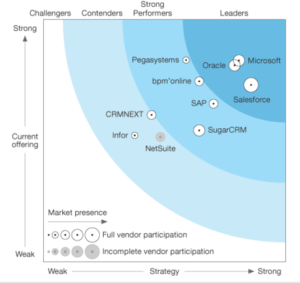 Within the search, the top 10 market players are identified, and Oracle scores brilliantly, so that Forrester ™ places Larry Ellison as a market leader! Oracle’s uniqueness is to connect multiple solutions (PRM-partner relationship management; SPM-sales performance management; CDM-customer data management; CPQ-configure price quote) with a single technology platform, thus giving users the opportunity to take advantage of the benefits of using a single model that can be extended to multiple vertical solutions such as, for example, time-to-value reduction.